Apple’s new operating ships with Flash Player installed. But what about all the Flash video on the web? Well, you can either install the battery-draining software or look for another option. But is there really another option? …the FlashtoHTML5 extension from Joris Vervuurt was Godsent. The extensions has a sole purpose: It replaces the CPU-hogging YouTube Flash Player with an HTML5 video player. Of course, YouTube has had an experimental HTML5 video player available for some time now, but Vervuurt’s dedicated extension beats YouTube’s solution on ease of use and the ability to choose maximum video resolution (360p, 720p, 1080p and 4K), plus it works with Flash videos embedded on other sites. One caveat: The extension depends upon whether or not YouTube has HTML5-friendly counterparts of Flash videos available on its servers. 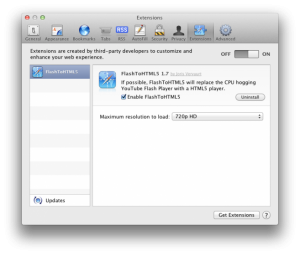 The FlashtoHTML5 extension is available here. The 9KB download requires Safari 5 and works like a charm under OS X Lion, especially used withClick2Flash, a Flash-blocking plug-in for Safari. There you have it. Are you ready to go at the world wide web flash-free? We are. Let us know if you give it a shot. « Mac OS Lion: Our first update has arrived—10.7.1. Anybody having any better luck with this “Upgrade”?